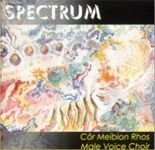 Recorded at St. Paul's Church, Pentre Broughton, Wrexham and at Plas Mwynwyr Rhos (STIWT) Theatre, Rhosllanerchrugog, Wrexham. With Special Thanks To Dave Finch & Tracey Green, The Mobile Recording Company. Recorded at Ysgol y Grango, Rhosllannerchrugog, June 26 & 27 2004. Cover design by Dylan Gwyn Jones. Musical Director W. Tudor Jones. Deputy Musical Director Emyr James (Tracks 7, 8, 14, 15). Accompanist Kevin J. Whitley. Keyboards Hywel Dodd (Tracks 14, 15). Soloists: Berwyn Dodd (Tracks 6, 15) Ian P. Jones, Aled Phillips (Track 8) Len Gilpin (Track 12).